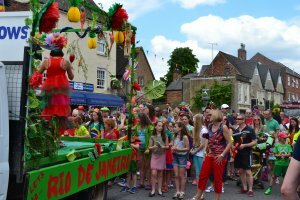 Duffield Carnival is a very popular annual event run by the Duffield Community Association. A procession of floats decorated by local schools, businesses and the community travel from Avenue Road, along King Street and down Town Street (A6) towards Eyes Meadow, where the festivities include a children's fun fair, stalls, music and exhibitions. The carnival is preceded by a week of activities. This year's Carnival took place on the 24th June 2017. Duffield's first music festival at Eyes Meadow took place in 2015, "The Eyes Have It", and has run every year since. It will take place on the Meadow during the weekend of 7th/8th/9th July in 2017.